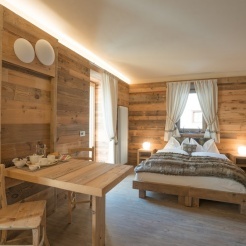 Al Baitin B&B is the perfect destination for an unforgettable experience at the heart of the Stelvio National Park in the Alta Valtellina valley. Come experience a long tradition of hospitality and service at our establishment: a typical mountain lodge built from local wood and stone at the heart of Santa Caterina Valfurva during the first half of the nineteenth century. Our B&B has been totally renovated to showcase aspects of traditions from times gone by, and natural features from the local area. Nestled in Valtellina, Santa Caterina Valfurva is located at the heart of the Stelvio National park, just a few miles from Bormio. There is no better opportunity to enjoy a truly unforgettable experience surrounded by nature. Whether you visit in summer or winter, there are a wide range of activities to enjoy.